← A TASTE FOR A MATE and TRINITY BOUND by Carrie Ann Ryan are on sale for .99c each for a limited time!!! Regency Romance between an angelic vicar and a devilish debutante: A must read if you love sweet and sizzle with an abundance of heart. Miss Rhododendron Mossant has given up on men, love, and worst of all, herself. Once a flirtatious beauty, the nightmares of her past have frozen her in fear. Ruined and ready to call it quits, all she can hope for is divine intervention. Justin White, Vicar turned Earl, has the looks of an angel but the heart of a rake. He isn’t prepared to marry and yet honor won’t allow anything less. Which poses something of a problem… because, by God, when it comes to this vixen, a war is is waging between his body and his soul. She’s hopeless and he’s hopelessly devoted. Together they must conquer the ton, her disgrace, and his empty pockets. With a little deviousness, and a miracle or two, is it possible this devilish match was really made in heaven? Hell of a Lady is the fourth book in the Devil’s Debutantes Series but can also be read as a standalone novel. A pink flower, from what he could recall. Hearty for landscaping. “One of my favorite flowers.” He would not make a joke of it. Could he woo this prickly young woman? As the thought crossed his mind, he brought himself up short. He was not looking for a wife. Was he? And he certainly couldn’t take on a woman in her circumstances. God, but she was a beauty though. And she tugged at him in a visceral way. His eyes searched her face; strong, high cheekbones; delicate arching brows, and lips, full, plump, the color of a pomegranate. “That doesn’t mean it isn’t beautiful,” he nearly whispered the words. He’d not meant to say them out loud. What else are people saying about the series? 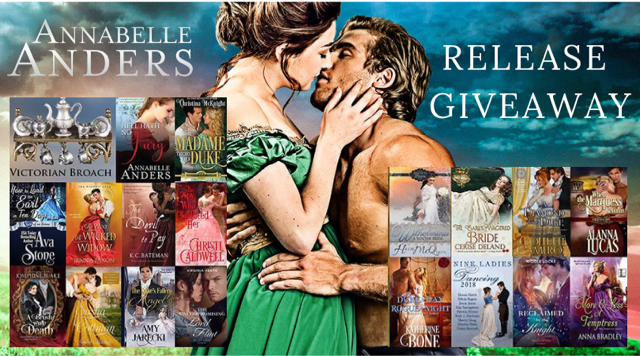 WIN a mix of ebooks, mostly signed paperbacks and swag – including a Victorian broach from Annabelle Anders!